Published on July 9, 2011,	by Jason in Family, Kids, Race. On Sunday, July 31, 2011 children ages 5 to 15 years will be running and biking as part of Run & Ride @ CambridgeSide duathlon event. Children are invited to compete in the second annual, kids only Cambridge duathlon taking place in and around CambridgeSide Galleria. In February, Cambridge signed on to the First Lady’s Let’s Move! campaign, which aims to solve the problem of childhood obesity within a generation. 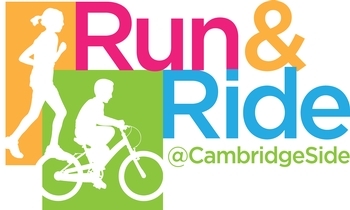 Run & Ride at CambridgeSide promotes active health and fitness for children. This event is an innovative community collaboration between CambridgeSide Galleria, City of Cambridge, Cambridge Public Health Department, Cambridge Police Department, Cambridge Fire Department, baystateparent magazine and Endurance Coaching. The event features prizes, race t-shirts, giveaways, entertainment and fun for the whole family. The race is free for all participants. For more information, please email csginfo@nedevelopment.com or call 617.621.8668.